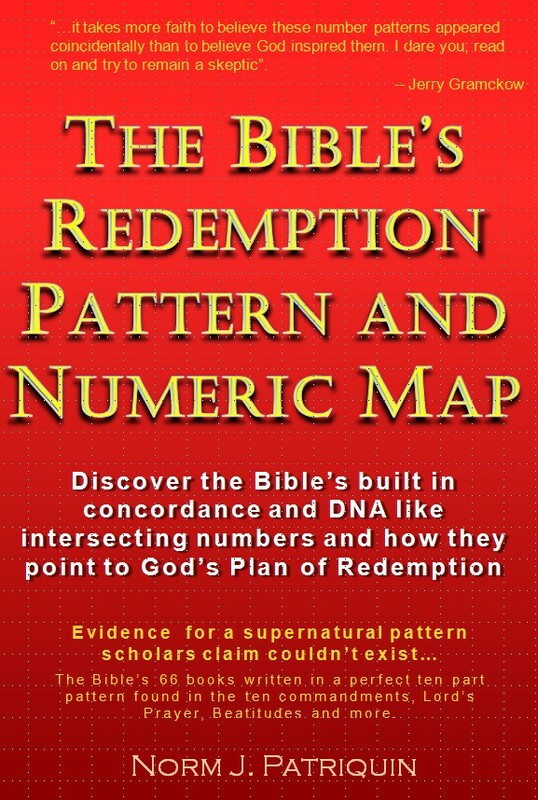 Throughout what I write I'm continually associating different aspects of numbers to show how they fit the meanings of the Redemption Pattern and I know how contrived this often must look. Using the same number; I may add digits for one example; subtract for another; multiple/divide for another; ignore some digits; move the digits around; and more. You would think that given all the ways I look at a number, it is no surprise I could make patterns fit whereever I like. You would not be discerning if you did not wonder if God really intended to manipulate numbers in this way. I can't adequately explain why I'm comfortable with my conclusions except to say that after looking and tens of thousands of examples, my mind recognizes and discerns between meaningful and unmeaningful ways to put numbers together. I'm sure that I get things wrong often enough but generally feel I'm presenting real God intended patterns that help us interpret the text. I suspect God has a supernatural exactness to all his numbering but it is one we cannot comprehend in our human minds. I do believe we can see the essence of the patterns and make use of the little we do understand. Following is a page that contains clues as to what to look for in numbers and how to see them in various ways to understand the patterns. To keep myself from writing a long unreadible document these explanations are intended to present what I look for but not try to explain them. The list is below. Note, like anyone studying the scriptures, we can't possibly understand so much of what God has written in his word. We must dare to carefully present what we believe we see but at the same time realize we may be totally in error - I do. Send me a message with comments, questions and disagreements because it is from such feedback that I experience the most growth and understanding in my studies. Don't assume numbers have definitions - When I give examples such as where like referenced verses have a thread of theme running through them, it is a natural desire for people to want a definition for a set of numbers and then to expect scripture to fit their definition. Numbering for any text is much too complex for this to happen. It is more correct to see that like numbered things are likely to contain aspects of similarity in their text. Each verse has many numbers associated with it so every verse is unique in its message. Use the patterns to see similarities rather than exactness. The preponderance of like digits and numbers - Finding a set of numbers with like digits or numbers increases the ability to discern major themes. I often look for number combinations such as verse 22:22 or cross Bible verse patterns such as 22122 because they more often reveal themes in a clearer way. Don't oversimplify themes - Our minds likes to containerize meanings in a neat little package but number themes are not that tightly defined. With only ten basic digits we cannot pin them down their meanings to ten simple phrases such as saying one is about God, two is about Jesus...etc. The basic ten digits each have very wide ranging themes but that are also unique and related in a general way. As numbers get more complex (more digits) it appears their combined meanings get more specific. For example, number one is related go God, leaders, pride, self, references to one, counting and other concepts we would naturally relate to #1. The number #11 which contains two ones still fits the theme of number one but seems defined down to a bit more specific level and is often associated with warnings. The number #111 goes to an even deeper leven and seems very often related to things such as God and the trinity, but even at this level there are multiple possible sub-themes. Don't try to make numbers fit themes so much but rather let patterns in how they are used suggest themes to you. One of my favorite examples of 111 related chapters is Ephesians chapter 4 which is the 1101st Bible chapter and is filled with references to #1 - Eph 4:4 "There is one body and one Spirit, just as also you were called in one hope of your calling." Notice the three mentions of the number one in this 1101st chapter? It seems about the sequence as well - Watch the order of digits in a number as related to the related themes found in the text. It appears even though #34 is related to #43 in theme, that often the order of the digits in the number reflects an aspect about how the theme applies. For example, in Romans 4:3 (#43) we first find the #4 and earthly/man related theme in the text and then find the #3 theme of righteousness - Rom 4:3 ..."ABRAHAM BELIEVED GOD, AND IT WAS CREDITED TO HIM AS RIGHTEOUSNESS." There seems to be a priority and level to numbers - When considering numbers related to a verse's theme, realize the theme relates to the book number theme, then the chapter number theme, and then the verse number theme and so on. The numbers are not necessarily all equal in priority when considering how they reflect the contents of the text. Watch for different but closely related numbers - Numbers relate in so many ways that you might often wonder how they can be differentiated at all. For example, numbers #27, #72, #77, and even #14 have very related themes. Understanding this helps catch very strong themes even though the numbers at first glance may not seem related. Ruth 4:9 is one of the best examples. It is the 7200th verse and the 72nd verse of Ruth which is an obvious number relationship. But realizing this is the 236th Bible chapter and that 2x36=72 strengthens the related theme. Even further, chapter and verse 4:9 multiplied together comes to 36 which is also a factor of 72. Ruth 4:9 Then Boaz said to the elders and all the people, "You are witnesses today that I have bought from the hand of Naomi all that belonged to Elimelech.... When you understand #72 is a number related to #77 and Jesus who paid the price for redemption then it helps the meaning of the text jump off the page. When you also know that #72 is often found associated with witnessing and specifically how Jesus testifies for himself, this strengthens your understanding of the verse even further. Knowing that #14 is a number for Jesus the King and 7+7/2x7 = 14 then we can see the potential association of Boaz to that of Jesus. Combining chapter and verse - Examining thousands of patterns reveals it is no accident that chapter and verse can be taken together for form a single number. They can also be multiplied, divided added or subtracted. How is this all possible and still have meaning? A mathematician can probably better answer that question than I but if you reveal the consistency of patterns I think you will see it for yourself. An example of this is in Judges chapter 6 which is a chapter about the sins of Israel. #6, #66 and #666 all relate to sin and redemption. Verse 6:6 says "Israel was brought very low because of Midian, and the sons of Israel cried to the LORD". So we have both chapter and verse related to #6 and this is also the 6661st Bible verse. This also occurs in the same chapter at verse 6:11 (6x11=66) which is the 6666th Bible verse - coincidence? The text, chapter, verse and cross Bible verse number all point to sin. In the next item we will see how the chapter number of 217 also points to sin. Adding and subtracting numbers - Using the example above about Judges 6:6 whose text, chapter, verse and cross Bible verse all relate to 6, 66, 666 and sin - as we examine this verse we consider the other numbers for a similar number pattern. When we realize we parts of numbers can be added or subtracted we may notice the cross Bible chapter number of Judges 6 is 217. In addition to other number relationships such as #27 we realize that if we subtract the middle digit #1 from #7 we get #6 which then makes #26 which corresponds to #66 (2 sixes). I know how contrived this sounds but there seem to be too many examples of this to be coincidence. Remember the 7200th verse of the Bible and the 72nd verse of Ruth - the chapter number was 236 (2x36=72). Did all these numbers line up by incredible happenstance? Judge for yourselves as you watch number combinations found by adding, subtracting, multiplying and dividing numbers. Taking first and last number digits (especially BVerse#) - In many examples I explain that the first and last digits of the cross Bible verse number seem to confirm patterns in the text and help validate other numbers that are related to the text. It seems the most frequently meaningful numbers in BVerse are the last two digits (low order) or the combined first and last digits. An example of this is found in Ezekiel 18:28 which is in the 820th Bible chapter and is the cross Bible verse number (Bverse) 20878. The verse text also points to the theme for #28 which is about Jesus, our High Priest who intercedes for us. Ezekiel 18:28 says "Because he considered and turned away from all his transgressions which he had committed, he shall surely live; he shall not die". Working from number pairs outside to inside - All kinds of numbers may be deduced from the Bverse number. For example, the Bverse number of 14322 can be seen as representing the meanings for; #14, #22, #12 and #42. It can also represent the reverse of these numbers #41, #21 and #24. Sometimes using #1 digit and sometimes not - I cannot explain why but the pattern is clear that when #1 is found in a number it may be included as part of the other digits to form a number or left entirely out. It can also be added or subtracted from other digits. Number #312 can be seen as #32, #23, #31 and #33. I have seen many patterns that suggest the center digit #1 can also be added to or subtracted from both other numbers. Since I don't understand this pattern well at all, I leave this as a curiosoty that others might watch for. Squares of Numbers - The square of #3 is 9 (3x3). Rather than try to explain the number relationships, I'll just state that I believe the squares of numbers produce related numbers. Reducing numbers by adding - 27=9 - It seems you can add the digits of a number to find a related meaning. #9s are very interesting - for example, 72 is 8x9 and 7+2=9. The reverse of 72 is 27 which is 3x9. I'm not suggesting this be done in every example being examined but to indicate to watch for such patterns between numbers and verse text. Repeating numbers 27=77, 36 = 666, 37=777 - Especially for numbers in the 31-39 range, but for other numbers as well, when a two or a three is one of the digits in a number, other related numbers can simply be represented by using two or three of the other number's digits. For example, both #27 and #72 are related to #77 (two sevens). Number 37 seems the most prolific and frequent example that has meaning - #37 and #73 relate to #777 which is a number for sanctification and salvation (clue, watch for the Bible's chapter number 37s). In the same way #36 is often related to #666 - the best example of this is Genesis 3:6 where Eve ate the fruit. The location of original sin in the Bible is related to the well known number for sin 6-6-6. Prime Numbers - It seems clear that prime numbers have special significance in their meanings. From what I have seen thus far, it seems the Bible treats #1 as a prime number where it seems most scientists do not. I'm not a mathematician so I can't comment further on this subject. Just something to watch for.